It is made with the exotic flavors of Thailand, that is - Lemongrass, Kaffir Lime leaves, Lime and Galangal. If you don't have these ingredients, I'm afraid you can not recreate the soup authentically.They are quite easy to find, these days almost everywhere.Tom Yum Goong is the Thai hot and sour soup made with prawns, whereas Tom Yum Gai is the one made with chicken, in case you're confused. They are both made quite similarly and you can use the same recipe for both. It's the tom yum freshly made paste and ingredients that make it so special. 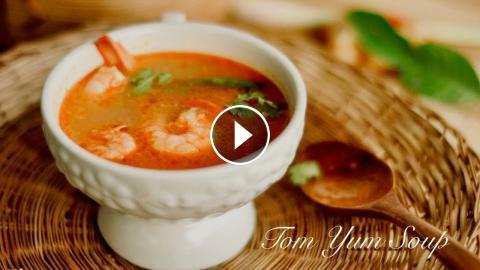 Today I am focusing on the most popular, Tom Yum Goong. Thai Chicken Noodle Soup Recipe ก๋วยเตี๋ยวไก่ฉีก - Hot Thai Kitchen!